Heutagogy is defined as self-determined learning, and is an extension of andragogy (Blaschke, 2012; Hase & Kenyon, 2001). It is a learner-centered approach that blends various concepts related to adult learning, double-loop learning, reflective practice and complexity theory. 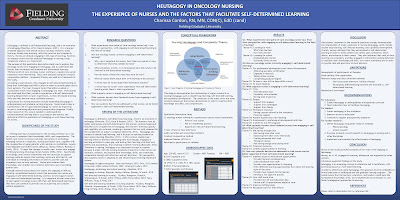 Nurses are already engaging in this type of learning, however, no research exists that has explored heutagogy in nursing, using complexity science as a framework. 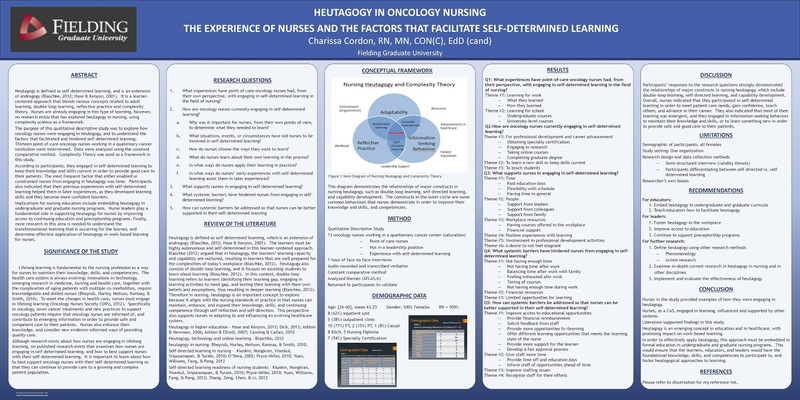 The purpose of this qualitative descriptive study was to explore how oncology nurses were engaging in heutagogy, and to understand the factors that facilitated and hindered self-determined learning. Thirteen point-of-care oncology nurses working in a quaternary cancer institution were interviewed. Data were analyzed using the constant comparative method. Complexity Theory was used as a framework in this study. According to participants, they engaged in self-determined learning to keep their knowledge and skills current in order to provide good care to their patients. The most frequent factor that either enabled or constrained nurses from engaging in heutagogy was time. Participants also indicated that their previous experiences with self-determined learning helped them in later experiences, as they developed learning skills and they became more confident learners. Implications for nursing education include embedding heutagogy in undergraduate and graduate nursing programs. Nurse leaders play a fundamental role in supporting heutagogy for nurses by improving access to continuing education and preceptorship programs. Finally, more research in this area is needed to understand the transformational learning that is occurring for the learner, and determine effective application of heutagogy in work-based learning for nurses.